From 2007-2016 we’ve seen an almost 500% growth in dairy ready to drink (RTD) beverage launches. But there are a few problems hindering continued growth. Age Gelation. After a few short months, the liquid gels into a mass that cannot be returned to its liquid state. 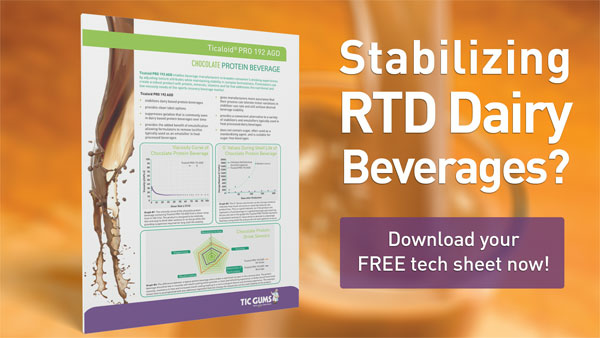 Many RTD beverages use UHT processing. During this process it’s believed that the milk proteins likely form links to one another which later results in gelation. Ticaloid® Pro 192 AGD is an excellent way to suppress age gelation in these shelf-stable beverages thereby increasing the product’s shelf life. This will also help to stabilize beverages with high protein and increased nutritional oil. Ticaloid PRO 192 AGD suppresses age gelation, stabilizes dairy-based protein beverages, provides clean label options and is an alternative to typical stabilizers. So don’t be hindered by age gelation. Address age gelation issues by talking to a Gum Guru today about your specific application. Call our technical support hotline +1-800-899-3953 / +1-410-273-7300 or chat live online.